CANTERBURY and DOVER, ENGLAND: Canterbury and Dover are both in the county of Kent, which is the hometown of father of evolution, Charles Darwin. Canterbury is a cathedral and university town. It doesn’t look like it now but it was bombed heavily during the WWII. The city still contains many ancient buildings, especially in the medieval town center. 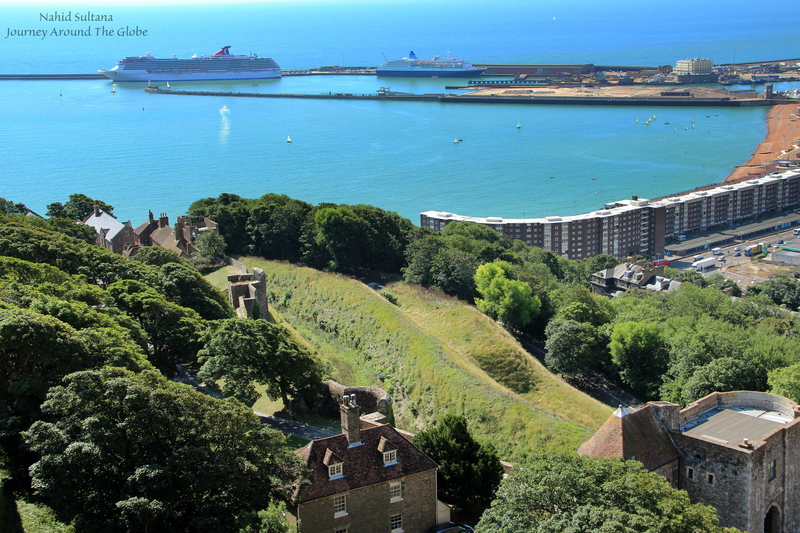 Dover is a port town with English Channel at one side. It’s a natural scenic city and very green too. We took a cruise to the Baltic Sea on the 1st week of August 2013. The cruise was for 12 days and left from the port of Dover. We drove to Calais, France from Belgium to take ferry to Dover, England. Ferry tickets were booked online ahead of time and the ride was about hour and half one way. The day we arrived Dover, we managed to visit only Canterbury. Dover Castle needed to wait until we were back from cruise. We were dropped off at Dover port again early in the morning after the cruise was over. We headed towards Dover Castle first thing in the morning. If you are going to in England for few days for visiting purposes, it’s better to buy an “English Heritage” membership. That way you can visit all of their properties free of charge and it includes some of the major touristic destinations like Stonehenge, Shakespeare’s birthplace, and so on. TIME of TRAVEL: Both the days we visited Canterbury and Dover were lovely and without rain. We weren’t so sure about the typical English weather but luckily the days turned out to be great for exploring. OUR HOTEL: We stayed at Holiday Inn in Ashford the night before boarding the ship. Ashford is a small town about 30 minutes’ drive from both Canterbury and Dover. Staying in Holiday Inn felt like I was in America…felt very homely. It’s a very nice hotel with free breakfast and free Wi-Fi (only in the lobby). England being the capital of curry or Indian cuisine (after India), we had to hit a local curry place. The restaurant was called “Spices of Bengal”, about less than 10 minute drive from Holiday Inn, with an excellent view of the valley down. Loved the typical English setting and their excellent taste of food. EATING and SHOPPING: Old town Canterbury has many cafes, restaurants, and shopping areas and probably one of the nicest places for meal or tea time. When you are in England, of course, fish and chips are everywhere, but I prefer their yummy meat pasties when I am here. Dover Castle has a small cafeteria inside and a souvenir shop where you can get many Great Britain souvenirs. Also, look for their variety of jam/jelly selections in the shop. PLACES WE’VE VISITED: We reached Dover by ferry from Calais, France about 1pm and from there we went straight to Canterbury to check its main spots. We had to catch our cruise boat by 2 pm the next day. If you have extra time, you can visit the Canterbury Castle which was built by the Normans in the 11th century which we missed this time. 1. CANTERBURY CATHEDRAL: This is a must see in Canterbury and a magnificent historical monument in England. In 597 AD when Pope Gregory sent an Italian monk, Augustine, to England as a missionary, he established a monastery here and then became England’s first archbishop. 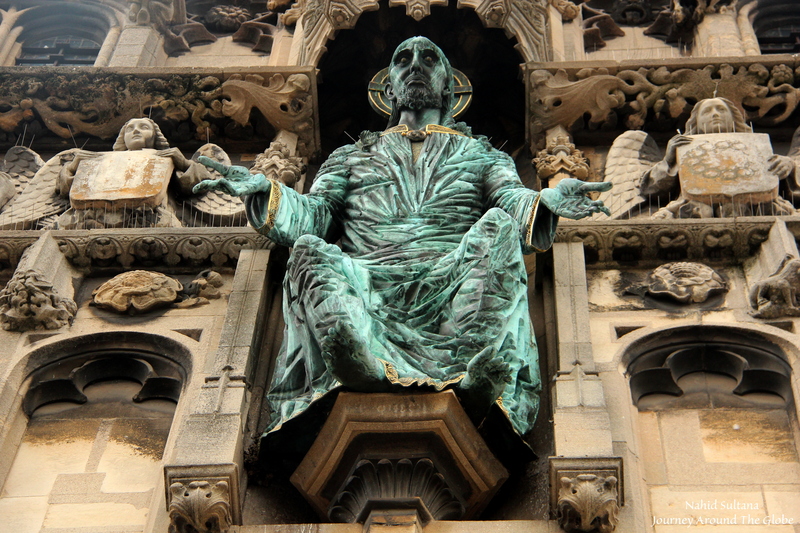 It became one of Europe’s most important pilgrimage centers after the murder of Archbishop Thomas Becket in 1170. It is still very much a working and living church and part of a UNESCO World Heritage Site. From outside, it’s a massive building with typical English style cathedral. Nave of Canterbury Cathedral is a 14th century Perpendicular Gothic architecture. Look up high and you can see the pillars soaring up to heaven. 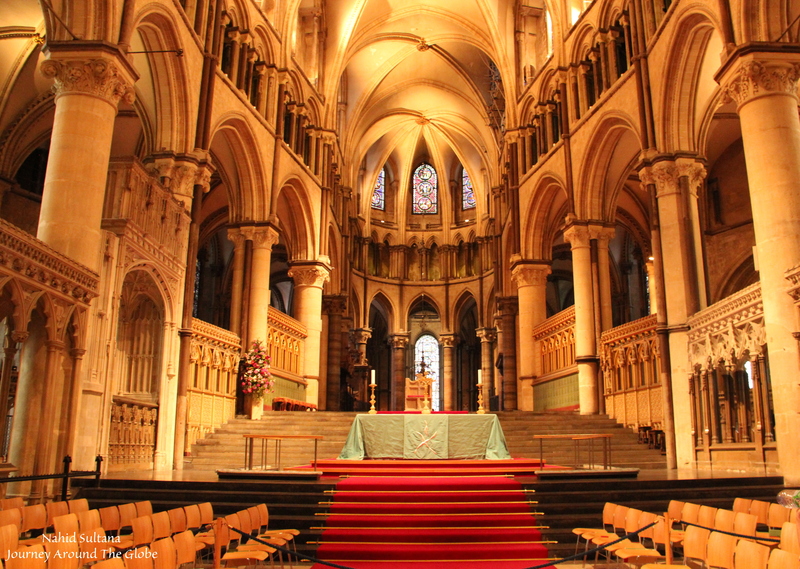 Visitors can see and pay respect to the exact place where Archbishop Thomas Becket was murdered in 12th century. Cloister of it has beautiful carvings of heraldic shields, fascinating faces, and animals. Don’t miss the crypt as it is the oldest part of the cathedral, dating back to 11th century. Note the round arches, decorated columns, and some of the oldest Christian wall paintings of England in the crypt. Trinity Chapel has some beautiful 12th century stained glass windows. But most importantly, it houses the royal tombs of King Henry IV and Edward, Prince of Wales, also known as “The Black Prince” along with many other archbishops from 13th and 14th century. It is a big cathedral and we needed about an hour to visit all the corners. The cathedral is open to the public from 7 am to 5:30 pm in summer time, from 9 am to 5 pm in winter time, and Sundays from 12:30 pm to 2:30 pm. Last entry is half an hour prior to closing time. Entry fee is 9.50 GBP for adults and 6.50 GBP for kids above 5 years. It’s about half an hour drive from Dover Ferry Terminal and there is a paid parking close to the cathedral. 2. 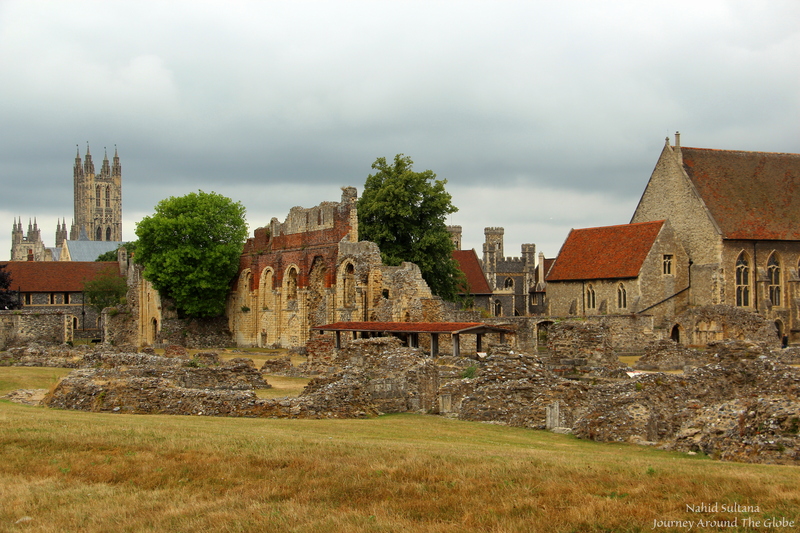 ST. AUGUSTINE’S ABBEY: This is one of the oldest and most important monasteries in the country. It was from here that the conversion of the English people to Christianity began. St. Augustine from Italy was sent here by the Pope in the 6th century. He began building the first church here soon after 597 AD. A thriving Anglo-Saxon monastery developed and its grounds became an important place of burial for several Anglo-Saxon kings, early archbishops, saints, and St. Augustine himself. Later, Normans built a great abbey here that flourished for four centuries until King Henry VIII pulled it down in 1538 and built a royal palace here. 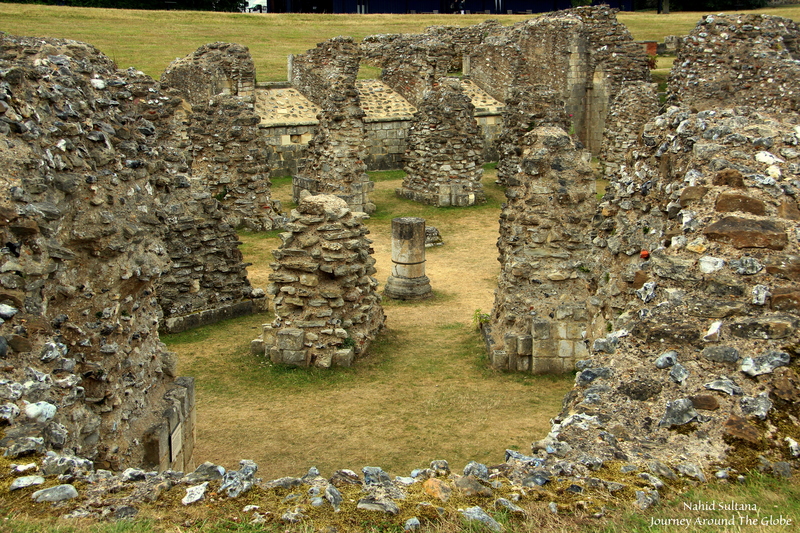 St. Augustine’s Abbey is also a UNESCO World Heritage Site. This big open space has lots and lots of ruins and grassy meadows. Take time, walk around and enjoy its elegant past. Then go inside the museum which holds a detail timeline of this place along with many things archeologists have found at the site. Ticket is 5 GBP per adult, 3 GBP for kids 5 – 15 years, and 13 GBP for family ticket. The ticket includes audio tour of the site and a small museum. Allow at least an hour for this forgotten abbey. It’s located within the walking distance from the cathedral and shouldn’t be missed. 3. ST. MARTIN’S CHURCH: This is the oldest English parish church in England dating back to 6th century. It is an active church and part of Canterbury World Heritage Site. Setting of this church is very peaceful with an old cemetery in its yard. We couldn’t go inside, because it’s only open on Tuesdays, Thursdays, and Saturdays from 11 – 4. It’s about 5-7 minutes of walk from St. Augustine’s Abbey. 4. 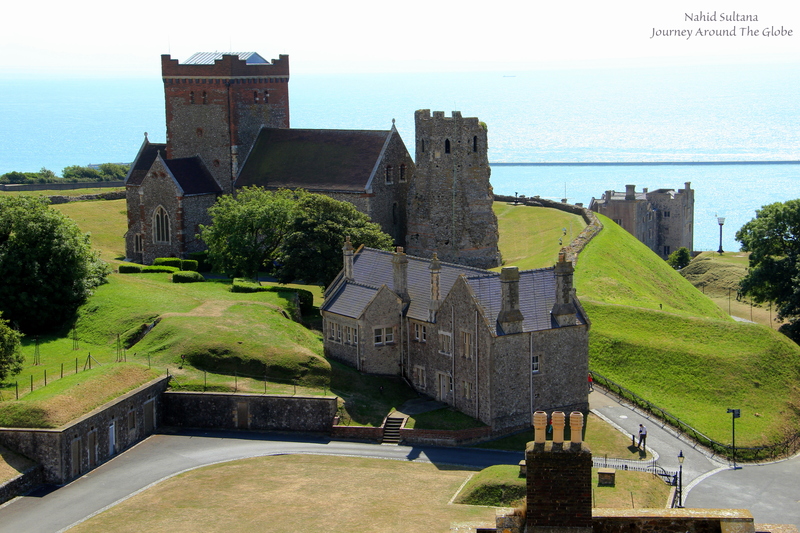 DOVER CASTLE: This is a 2000 years old fortification that have been protecting English coast since 1180. King Henry II built this present castle on the beautiful White Cliffs of Dover. Roman Lighthouse or Roman pharos is the oldest building in the castle standing right beside a Saxon church, called Church of St Mary-In-Castro. This Roman lighthouse is considered to be one of the oldest buildings in Britain which was built on the site of Dover Castle. At the heart of the castle lies the inner bailey and Great Tower. Great Tower, once the royal palace, is now recreated to its 1180s glory. Don’t be lazy to climb to its roof for some brilliant views. Many sections/barracks of this castle features different museums and settings from the old time. There are some underground tunnels, secret wartime tunnels, an underground hospital, and casemates here which are accessible to publics by guided tours. By the way, do go to Princess of Wales’ Royal Regiment Museum for some wartime memorabilia. Finally, the English Channel, Dover Port, and white chalk cliffs look amazing when you stand on hills or from any towers. Dover Castle is very kid and family friendly. We saw a small interactive play of King Henry II with his daughter, Mathilda and constable inside the Great Tower. There were also some archers dressed in medieval armory in front of cafeteria teaching kids’ archery. Pick up a map from the tourist office and enjoy the vast land of this fort. There is a free train ride to help you get around the site. 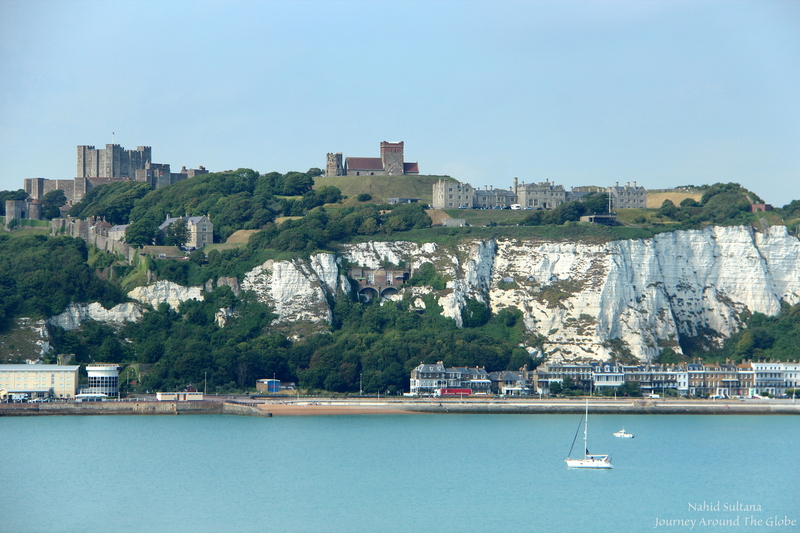 Dover port is the closest port to Continental Europe from mainland Britain. If you are coming from a ship or ferry you can see the towers of Dover Castle from far away with the white cliffs down below. Always enjoy taking a trip through your pictures and words. Thanks for sharing the beautiful, old architecture of England. Canterbury is a beautiful place, though I must say visiting England in summer (when everyone there is desperate to get out) is an interesting choice!